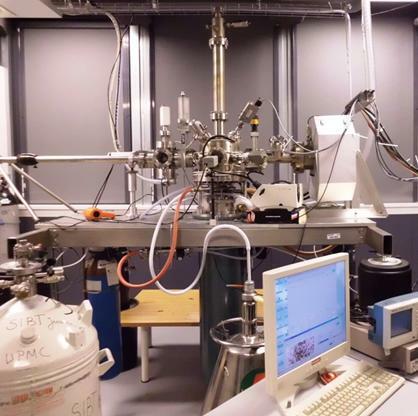 The low temperature STM “M2”, first all-digital microscope, was commissioned in 2000. It is composed of an analysis UHV chamber (10-9mbar) connected to a fast entry load-lock. 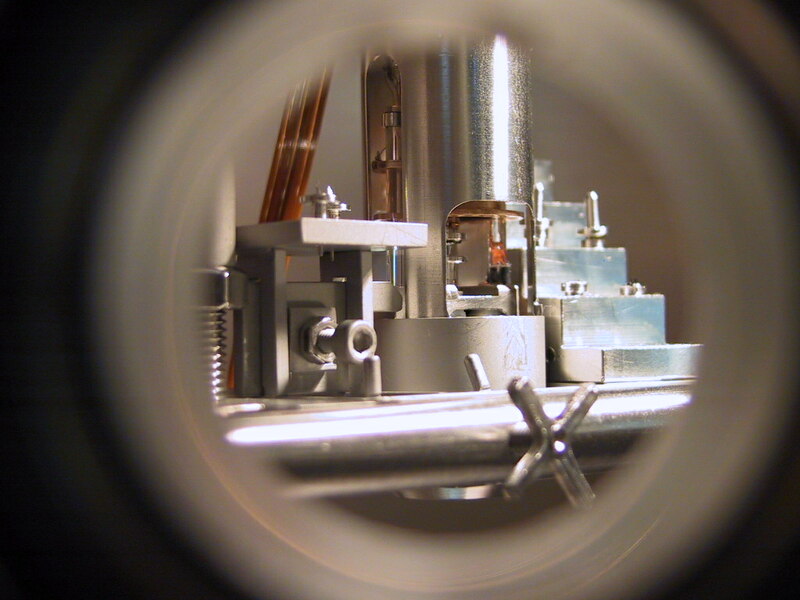 A cold finger connected to a helium cryostat enables the cooling of the STM head to 2K in the presence of an exchange gas (He). The set-up is supported by a chassis with anti-vibration legs. 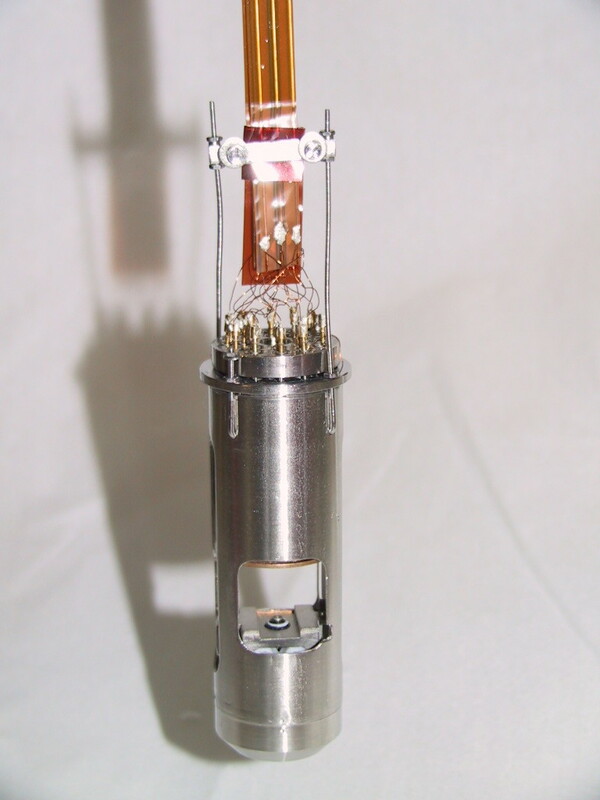 A superconducting coil can produce a magnetic field up to 6 Tesla normal to the sample surface. 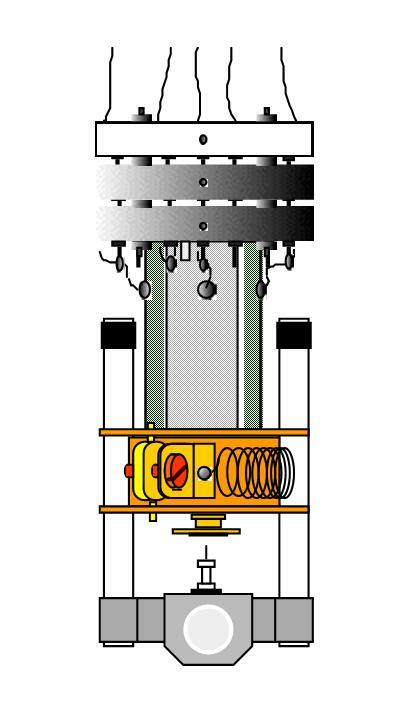 The microscope was designed and built by Prof. D. Rodichev. It is composed of two piezoelectric coaxial tubes. The outer tube is used as a motor for the inertial coarse approach, the tip being mounted on a trolley sliding between two bars of sapphire. The piezoelectric inner tube is used for scanning the surface above the tip. STM topography and spectroscopy are controlled by a PC via a DSP card (Innovative Integration M44). All the operations of the microscope and data acquisition, including feedback loop, coarse approach, etc. .. are executed either by the embedded software on the electronic card or by an original software developed in the laboratory (Prof. W. Sacks and F. Breton). The electronic controller was designed in order to achieve tunneling spectra at each point of a standard STM topography image. This mode, called “Topo-Spectro” (or also “Current Imaging Tunneling Spectroscopy”), provides detailed maps of the local density of states of the sample surface. The system was specifically elaborated for the study of vortex states in superconductors by means of “Josephson microscopy”. The principle of Josephson microscopy is to use a superconducting tip for performing local tunneling spectra of a superconducting sample. The resulting measured current is made of Cooper pairs. The local variation of the tunneling current of Cooper pairs is intimately linked to the order parameter (superconducting wave function) characteristics of the probed superconductors.